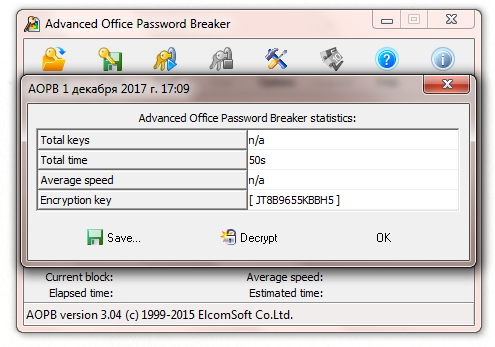 Advanced Office Password Breaker | Elcomsoft Co.Ltd. Remove password protection from documents in Microsoft Word 97/2000 and Excel 97/2000 format (as well as Office XP/2003 with default encryption) in a matter of minutes. The tool attacks 40-bit encryption keys instead of the lengthy passwords, achieving a 97% password recovery rate for Excel spreadsheets and offering unprecedented 100% recovery guarantee for Microsoft Word 97/2000 documents. Supports: Microsoft Word 97/2000 documents, Excel 97/2000 spreadsheets, 40-bit encryption, Thunder Tables®, documents saved in modern Microsoft Office in Office 97/2000 Compatibility mode. Unlock password-protected Word documents and Excel spreadsheets by breaking the password instead of recovering it. It does not matter how long and complex your password is. 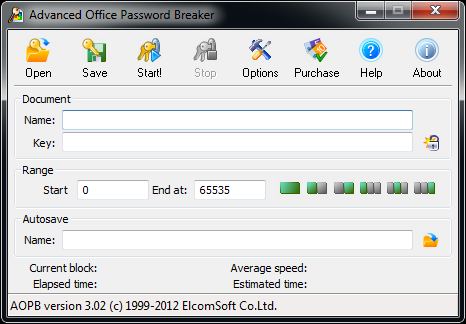 Advanced Office Password Breaker unlocks your documents with a guaranteed positive result and no guessing involved. How fast? A typical single-core PC of yesterday can unlock a document in less than 5 days, while a dual-core PC of today can do it twice as fast. Still not fast enough? Use quad-core processors, add more CPUs or assign several workstations to recover the passwords in almost no time! Unlike competition, Advanced Office Password Breaker does not play the guessing game. Instead, it reaches deep to access low-level encryption keys that protect your documents. Surprisingly, Microsoft has chosen a weak 40-bit encryption to protect Microsoft Word and Excel documents. Attacking the low-level 40-bit encryption key instead of attempting to guess variable-length alphanumerical passwords guarantees positive results within a limited and reasonable timeframe. 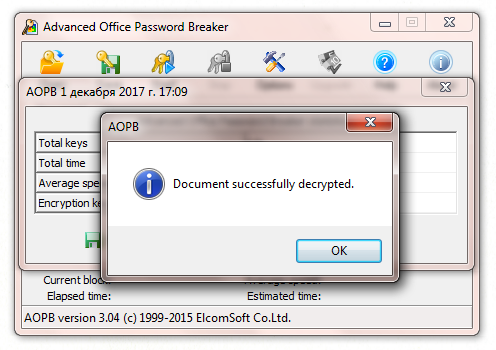 Advanced Office Password Breaker specifically addresses the weak 40-bit encryption employed in Microsoft Word and Excel 97/2000 as well as the documents saved in Office XP/2003 with default encryption settings. While effectively unlocking documents within guaranteed timeframes, Advanced Office Password Breaker does not recover the original passwords. Recover passwords protecting other Microsoft documents e.g. PowerPoint, Money etc. Frequently Asked Question: AOPR or AOPB? Forgetting a password to your own Word document or Excel worksheet is surely annoying, but interfering with the office workflow causes substantial damage. If you’re not in hurry, you can try guessing the password. If you have no time to play games, just unlock your documents and spreadsheets – guaranteed! No matter how long and complex your passwords are, Advanced Office Password breaker recovers Word documents and Excel spreadsheets within a limited timeframe. No need to perform lengthy attacks while a 40-bit encryption key can be crunched quickly and efficiently, and more importantly, with a guaranteed positive result. Advanced Office Password Breaker unlocks documents created with Microsoft Office Word and Excel 97 and 2000, as well as documents saved with Microsoft Office XP and 2003 in Office 97/2000 Compatibility Mode. The Professional edition of Advanced Office Password Breaker supports up to 4 processor cores or dedicated CPUs, allowing you to recover the password in one-fourth of the time. The Enterprise edition allows using even more processors and cores, making your mainframe supercomputer a perfect password-breaking machine. A highly optimized low-level code allows Advanced Office Password Breaker to benefit from using multiple CPU cores and additional processors much more than any other application, cutting the recovery time in the direct proportion to the number of available processors. Using a quad-core computer is still not speedy enough? Split password recovery tasks into several ranges and run them on several computers at the same time to unlock your documents even faster! Have an extra laptop collecting dust while your workstation is overheating? 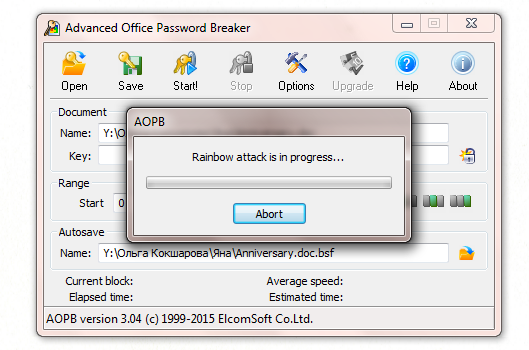 Install Advanced Office Password Breaker to the laptop and get your documents faster yet! You can divide the job between as many workstations as you need instead of using a single supercomputer - with essentially the same result. The unique Thunder Tables® technology developed by ElcomSoft uses pre-computed tables to significantly speed up the recovery of 40-bit keys for Microsoft Word files. The technology is available in the Enterprise edition, and will unlock a protected Word document in a matter of minutes instead of days, even on slow computers. By pre-computing these hash tables, and providing them on a DVD or a USB thumb drive, Advanced Office Password Breaker makes short work of password-protected Word documents that use 40-bit encryption. For Microsoft Excel files, pre-computed hash tables (Rainbow Tables) are provided, that allow unlocking about 97% of Excel documents spreadsheets. The complete set of tables (Thunder Tables® for Word and Rainbow Tables for Excel) is shipped on a DVD. Trial version works only on single-CPU systems, i.e. uses only one CPU/core at a time regardless the number of CPUs/cores installed, and does not allow have two copies of the program running at the same time. Also, once the encryption key is found, it does not allow decrypting the document (though shows the key for the future use).